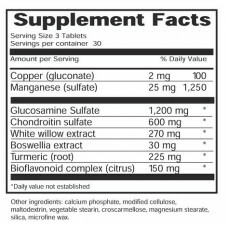 Glucosamine Sulfate and Chondroitin combined with natural anti-inflammatory agents, White Willow (natural salicin), Boswellia, Turmeric, (source of curcuminoids), and Bioflavonoids. Provides the pharmaceutical grade proteoglycans necessary for healthy intact cartilage and joint tissues with standardized botanical extracts to supply a nondrug response for both acute and chronic conditions. Boswellia - traditionally used to treat respiratory ailments, joint pain, and inflammation. Baldrian Plus may be beneficial for Muscle Relaxant, Amyotrophic Lateral Sclerosis, Headache, Leg Cramps, Muscle Cramping, Spasm, Muscular SorenessVitaminerals Baldrian plus has a record of providing fast, effective relief from muscle spasms, trauma, sprain, strain or other musculoskeletal conditions. 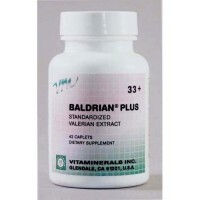 Baldrian Plus is standardized using K-K units, the only measurement of biological activity to provide consistent dependable results.2 caplets provide:Baldrian350 mgMagnesium250 mgOther ingredients: Calcium phosphate, cellulose, vegetable stearin, magnesium stearate..
Do Vitamins Work for Stress and Depression?